This kit is equipped with two long throw 15 inch bass drivers, delivering a powerful and punchy bass even from 30 Hz. This subwoofer is the ideal solution for powerful and clean bass, especially when you are bass fanatic and like to run your own mobile disco or have a lot of parties. At these high outputs the crossover becomes quite expensive. We, therefore, recommend to use an active crossover. You save a lot of money for further crossovers, are able to adjust the crossover frequencies more accurately and achieve a better sound. 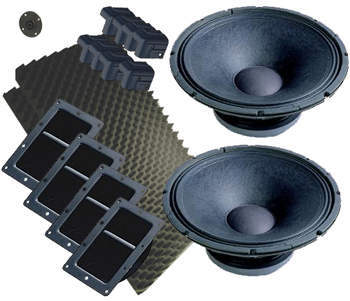 If you still want to use a passive crossover, we have a crossover kit for 800 Watts available. The subwoofer doesn't come with bass reflex tubes, it rather has a bass reflex channel. The channel is cheaper and also adds some bracing support to the cabinet. Drivers are two Eminence Kappa 15 LF with a linear excursion of 5.5 mm. Power handling of the subwoofer is 1200 Watts (RMS). The cabinet should be made from 19 mm MDF.